Anyway, I recently had two pieces of good news that I’m just dying to share and it’s all about Hubby-jr my four year old son. First, Hubby-jr has progressed quite a fair bit in school – he’s playing with his peers! We had our last parent-teacher meeting just before the school break and it was so great to hear some good news for a change (as you can guess, the first meeting wasn’t too great). Apparently he initiated play with some of his classmates on several occasions! With some help from his class teacher in the communication process they end up playing. It’s great news considering one of the major concerns of his class teacher the last time we met was that he didn’t play much with his peers. Second, Hubby-jr doesn’t need to wear a hearing aid (at least not for now)! Yup, that’s what the audiologist told us at our last hearing test a week ago (audiologist wanted monthly checks just to make sure hearing loss was not progressive). When she tested him on hearing using both ears he could pick up sounds on a normal range. So that means he is able to use his good ear to compensate. What’s more there were no deterioration in his right ear hearing loss, so now they’d only need to monitor his hearing every 6 months instead of every month! Needless to say I was estatic and relieved! I feel like we’ve reached the silver lining! We still need to work on his speech. Almost the entire holiday is filled with weekly speech therapy sessions. 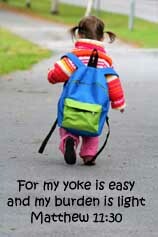 And when school starts I won’t have the luxury of resting on my laurels. The audiologist advised me to get the daily lesson plans from his class teacher so that I can either prepare him for his school day beforehand or revise it with him when he gets home. The pressing matter for now is to aid him in acquiring his speech. So that when he reaches primary one, in a bigger classroom albeit noisier setting even if he can’t hear 100% he’d have enough cognitive ability to guess what is being said most of the time. So it’s gonna be a lot of hardwork for both of us but at least I know what we can and should do and I know we’ll progress. It’s wonderfully hopeful and simply great. I couldn’t have asked for a better ending to the school year. This is a photo of Hubby-jr at his first hearing test or as he knows it a “hearing game”. He gets to play a few different games at each session. 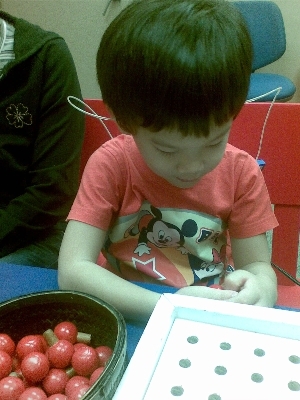 At this one he has to put one of those red wooden buttons into the board each time he hears a sound. I am so happy for your good news. You are a wonderful, devoted mother….